One time photo imprint fee of $30.00 will be added to your total. When will I get my order? : Orders are processed in 2 weeks. Then refer to this map (Click here for map) to calculate the additional shipping time. Your mugs ship from NY. It is hard to believe that the quality of these high definition personalized photo mugs is so high given the price. They are perfect as wedding favors or gifts for a baptism, Bar Mitzvah, anniversary party, family reunion or any event celebrating a special guest. You may also use these as corporate giveaways with a full color logo. For an additional .50 each, you can also use these mugs as place card holders. We will personalize each one with a guest name and table number. Just provide us with a spreadsheet with all of their names. The photo imprint area is approx. 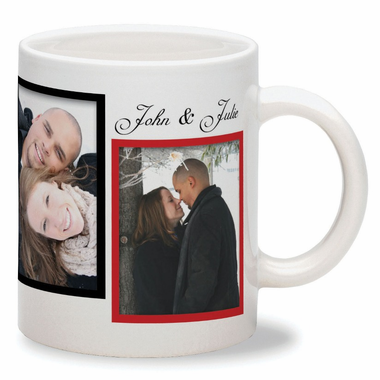 8" w x 3" h which means that your photo(s) or design wraps around the entire mug. Measuring 4-5/8"w x 3-3/4"h, each mug holds 11 oz. of liquid. You can also fill it with candy and wrap it with cellophane for a spectacular favor. Email a high resolution photo, at least 300 dpi, with 600 dpi being ideal to: info@cool-party-favors.com . If you don't know the resolution, send it anyway and we will let you know if your photo will work.